There is a new website on the web: The Truth About Palestinian Rock-Throwing. (OCT. 14, 2013) Two new short video documentaries expose how certain “news” entities and “human rights” groups help enable the Palestinian rock-throwing culture –– yet ignore or vilify the Jews who’ve been maimed and killed by it. Adele, 3, nearly killed by Palestinian rock-throwers - now left with traumatic brain injury. Adele, 3, nearly killed by Palestinian rock-throwers. Many people know that Palestinians engage in various forms of terrorism, and that they indoctrinate their children to view murdering Jews as their highest aspiration. What many in the West aren’t aware of, however, is the proliferation of Palestinian rock-throwing against Jewish civilians, and particularly, the cars they are driving, hoping to cause them to crash. This terrorist act has resulted in hundreds of Jews being seriously injured or killed – yet it is both perpetrated and celebrated by Palestinians young and old. Most recently, in March 2013 three-year-old Adele Biton was left with severe traumatic brain injury as a result of a Palestinian rock attack. One reason that most people in the West are unaware of Palestinian rock-throwing and its victims is that various prominent “news” entities and “human rights” groups openly sympathize with the perpetrators, and ignore or vilify the victims. The goal of the site is not only to create general awareness of Palestinian rock-throwing and its victims -- but also to make people aware that tax money from the West goes to the Palestinian regimes which foster this situation. This video exposes how a prominent “human rights” group and major “news” entities elicited a global sympathy campaign for a Palestinian child who was caught throwing rocks at passing Jewish cars, falsely claiming he was “unlawfully detained” or “arrested.” Yet these same entities completely ignored three-year-old Adele Biton, and all the other recent Jewish victims of Palestinian rock throwing. The Truth About Palestinian Rock-Throwing is an incredibly important project that deserves our attention and support. The U.N. Relief and Works Agency for Palestine Refugees (UN-RWA) is the NGO to which governments deposit the money they have appropriated for “humanitarian aid” to Palestinians. 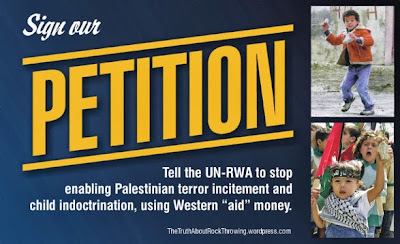 Yet as Palestinian Media Watch and NGO-Monitor have been documenting for years, UN-RWA has been allowing this aid money to be used for the incitement and glorification of terrorism, and indoctrinating children to hate Jews. See a roundup of our research here. Read the whole thing -- and sign their petition. 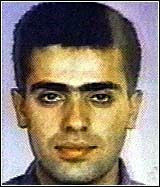 Technorati Tag: Israel and Palestinians and Rock Throwing.